Pretty Good Solitaire Mac Edition version 2.50 with 500 games is now available. This update adds 40 new games, bringing the total to 500. The new games are Apophis, Bavarian Patience, Box Kite, Castle's End, Cheops, Darwin, Dieppe, Dover, Dutch Solitaire, Eighteens, Farmer's Wife, Fly, Geoffrey, Gnat, Great River, Housefly, How They Run, Indefatigable, Junction, Lanes, Last Chance, Little Billie, Outback, Panther Creek, Pyramid Dozen, Pyramid Rank, Pyramid Seven, Quadruple Yukon, Roslyn, Russian Cell, Samara, Selective Castle, Simplex, Spaulding, Stronghold, Toni, Triple Demons, Vincent, White Horse, and Yukon Spider. Also new in this version is a main screen search filter - just type in part of a game name and only the games with that name will show. For example, type in "free" and you will see "FreeCell", "Double FreeCell", "Free Fan", etc. This is a quick way to find the game you are looking for. The Mac Edition runs on OS X version 10.4 or later - including Snow Leopard, Lion, and Mountain Lion. It does NOT run on iPads, iPhones, or iPods. However, all of these 500 games are in the iPad version at http://www.goodsol.com/ipad or directly from the App Store at https://itunes.apple.com/us/app/pretty-good-solitaire/id645018925?ls=1&mt=8 . Don't worry, Windows users, we haven't forgotten you! Pretty Good Solitaire for Windows contains 810 solitaire games and was most recently updated at the the beginning of the summer. It will be updating again soon with more new games. In the meantime, see the 810 games at http://www.goodsol.com/pgs and don't forget that you can download additional card sets at http://www.goodsol.com/pgs/cardsets.html . We have 20 card sets available, such as the Tropical Card Set and Wood Card Set and more. 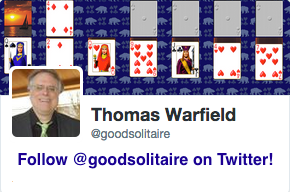 There are also 8 card sets that were created by Pretty Good Solitaire users. 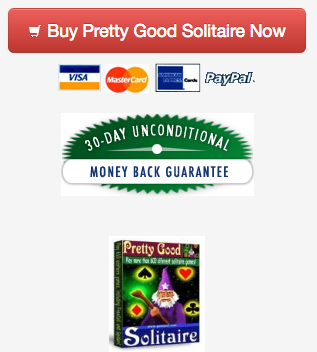 Pretty Good Solitaire is on Facebook at http://www.facebook.com/goodsol . Over the next few weeks I'll be posting links to some old featured games from old newsletters. Come to our page, like us, and check out the first two links for Klondike and FreeCell. This game is at Geoffrey.